Greg and I love going to live sporting events, especially for the Los Angeles Lakers which we have both been fans of since we were kids. Then when we moved to San Francisco 4 years ago we started going to Giants games. THEN we actually moved across the street from AT&T Park where the Giants play and that’s when we officially became fans. We loved going to games, especially when friends and family came to visit. I mean, who doesn’t love watching a live sports game with beer, peanuts, and garlic fries?! Lame people, that’s who! So one of the things we knew we wanted to do during our trip was go to sporting events in other countries. See what they eat, cheer for the local team, checkout their stadium, and just have a local good time! Our first local sports experience was in Tokyo, Japan when we went to cheer on the Yomiuri Giants. This was extra fun since they are basically a knockoff of the San Francisco Giants, so of course I wore my SF Giants hat. 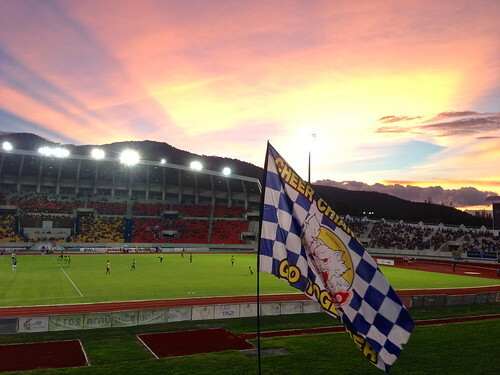 Last weekend we enjoyed our second local sports experience along with some friends here in Chiang Mai. For 60 baht we cheered on the Chiang Mai Football (a.k.a. soccer) Club Lanna Tigers with some spring rolls and 60 Baht ($1.93) giant beers (quite the deal compared to the $80 nosebleeds and $10 beers at home). Our group sat behind the band with the rowdy crowd cheering and chanting to Lady GaGa themed songs the whole game. Have you been to a sporting event in another country? That’s so cool! I haven’t ever been to a sporting even in another country, but I would love to! Sports bring out the crazy sometimes and I’d love to see how tradition varies in different cultures. It was so much fun! Everyone was super nice too with helping us learn the chants and telling us what was going on when we didn’t understand what happened on the field. I love Thai people!